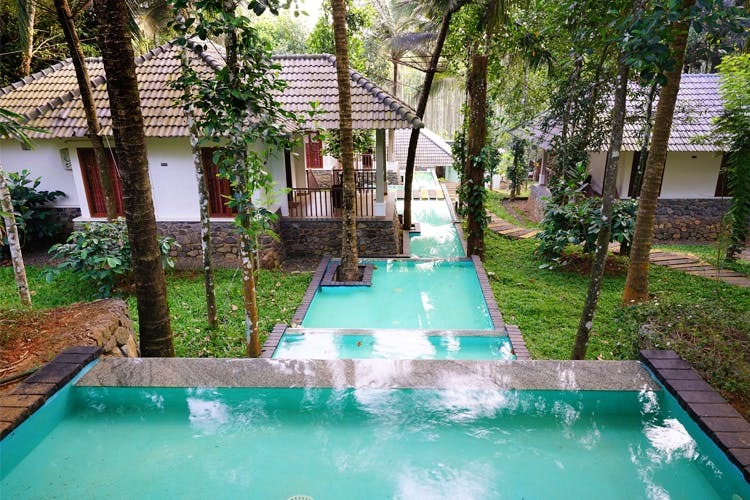 A gorgeous property with pools all around Kerala-style villas, OYO Century Village Resort in Wayanad is a great choice for a long weekend in God’s Own Country. Remote but not cut away from the city life or devoid of any modern amenities, OYO Century Village resort, in Wayanad, has a 24-hour front desk, room service, WiFi, and spa to keep things all cool and comfy. Check into Kerala-style villas with the water-front villa easily stealing the spotlight from the rest of the place. But since the whole place is surrounded by pools, you get the feeling you are in the on an island. You even have to cross small bridges to reach the outdoor dining area, beside a large pond that’s filled with geese lazing about. Don’t go trying to feed them, but feel free to dip your toes into the pool. Since there isn’t much to do within the property, head out. The Makkiyyad and Banasuramal Waterfalls are within the 10-kilometre radius. During monsoons, the waterfalls are quite the sight with water gushing about from almost everywhere. The Bandipur National Park and Nagarhole Tiger Reserve are also two places that you can hit up. Only about 60kms away, make a day of it, especially if you have kids. Campfires and BBQs can be arranged on request and come evenings the place can get quite chilly. So take some games, or books, and certainly marshmallows to sit around the campfire for a long night under the stars. You can book the property here. Make sure to take mosquito repellant. There are plenty of those creatures, and you must be prepared.